If you decided to use the free version of WordPress open-source software for blog and website management, you would need to obtain a suitable hosting for your site. 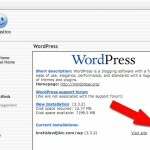 There are thousands of hosting providers nowadays, and usually it’s possible to install WordPress on any of them. The two most important requirements are PHP scripting language support and MySQL databases support. If you decided to use the free version of WordPress open-source software for blog and website management, you would need to obtain a suitable hosting for your site. There are thousands of hosting providers nowadays, and usually it’s possible to install WordPress on any of them. The two most important requirements are PHP scripting language support and MySQL databases support. If your haven’t selected your web hosting provider yet, we strongly recommend you to select one that’s based on cPanel. This is software installed on the server that allows you to manage all parameters of your hosting account easier and faster, using point and click methods. On of the providers that’s based on cPanel is HostGator, so feel free to get a package for your site if you are about to use WordPress. Once you equipped your site with a suitable cPanel based host, it’s time to install WordPress. There are cPanel versions that come without Fantastico module, but they are rare. 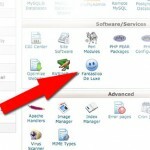 Login to your cPanel and look for the Fantastico icon. If you see it, then you can install WordPress (and many other scripts) within minutes. So, to start, click on the Fantastico (it might be named as Fantastico De Luxe as well) icon. The Fantastico interface will now open, and you will have the list of all supported scripts in the left sidebar. Click on the WordPress link to proceed. You will see a page with some information about WordPress and link New Installation. Click this link to start your installation. The first of the following three pages that will guide you through the installation will appear. Under the Installation location, your should select your domain, then enter subfolder where to install WordPress (or leave empty to install it in the root folder). Under Admin access data, you should enter your desired username and password for the master WordPress account (administrator). Finally, under Base configuration, you should enter administrator’s nickname and email, as well as site’s title and short description. To continue, click the Install WordPress button. If all went well, the second screen should look as on our example. You are almost done! Otherwise, you should read the error message (red colored), click Back button in your browser, and correct the errors. To continue, click the Finish Installation button. The final screen will give you some information. It shows where on the server you installed WordPress and how you can access the WordPress’ dashboard. Also, it reminds you about your administrator’s username and password. It’s possible to send an email to yourself as a reminder of this installation and about access parameters. Click on the link that leads to your dashboard (it looks like this “http://www.yoursite.com/yourfolder/wp-admin”) to see your new WordPress control panel. Finally, your new site is ready to be filled with content (your site can be accessed with http://www.yoursite.com/yourfolder”). 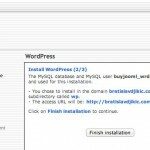 If you ever decide to delete this WordPress installation, you can do it through cPanel and Fantastico, with 2-3 clicks. So, login to your cPanel, click the Fantastico icon and select WordPress from the left sidebar. You will see your installation. 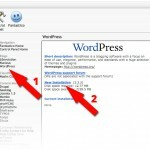 Clicking the Remove link and then click on the Remove WordPress button will remove this installation and destroy all files and data.